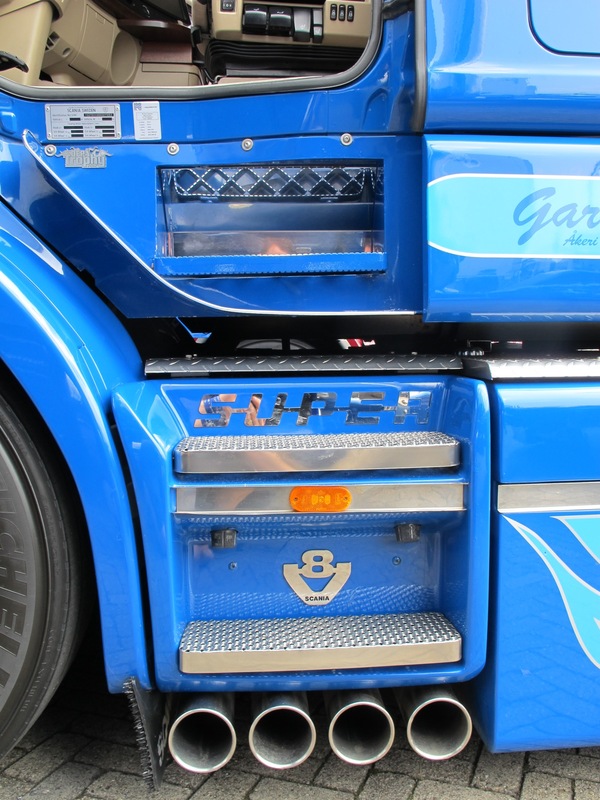 There’s been a lot of new recruits to the blog this year, on the www, Twitter and through the Facebook page so I thought I better tell you my credentials as I’m not just a wanna be trucker (although I do wanna be one again! ), I have been there and done a bit. It goes something like this. Now this is a story all about how, my life got flipped-turned upside down, and I’d like to take a minute, just sit right there, and I’ll tell you how I became trucking nerd…… Oh no hang on that doesn’t rhyme!! At the beginning of 1997 I was tasked on a college course to formulate a business plan that would or could work. It turns out the plan worked and the bank were keen so before I finished college I got a DAF 45 on order and started looking for work. 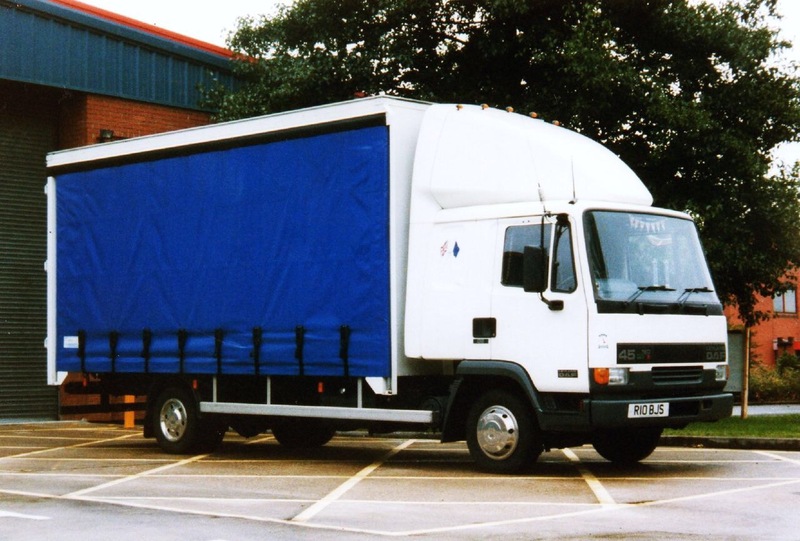 In October ’97 I started as a Subbie for DFDS distribution in Coggeshall, Essex. 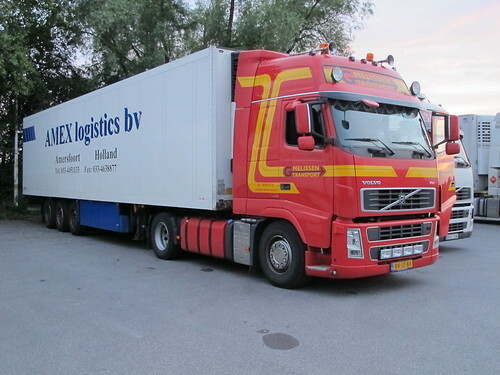 I was soon covering…..
On a daily basis with anything between 15-20 deliveries and collections. 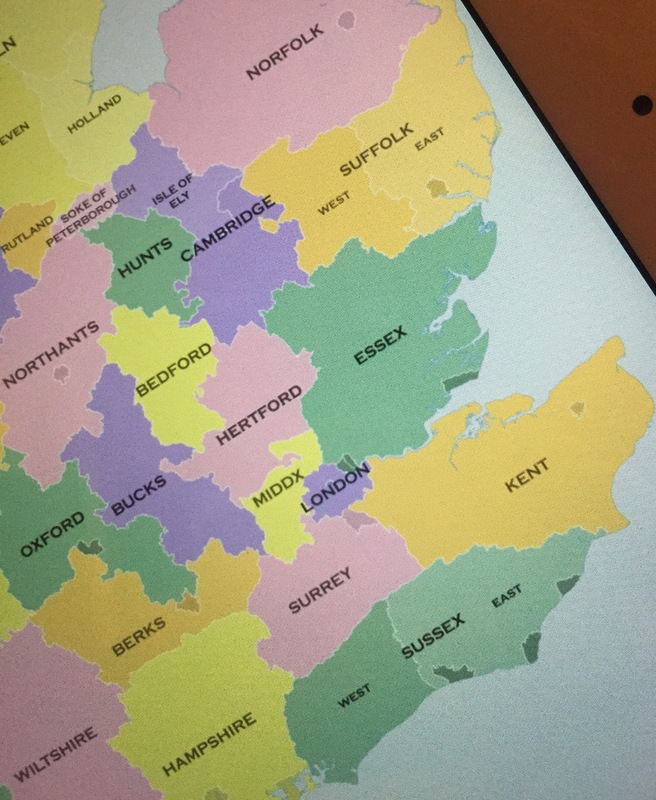 What a way to learn my way about (no Sat-Navs then younger readers just a box of maps!) maps I hear you say?? Yep read THIS BLOG. I still use some of the short cuts now! A year or so later and DFDS moved to Purfleet and I didn’t follow. Local business soon started giving me work and I was soon UK wide with loads of virtually everything and anything. 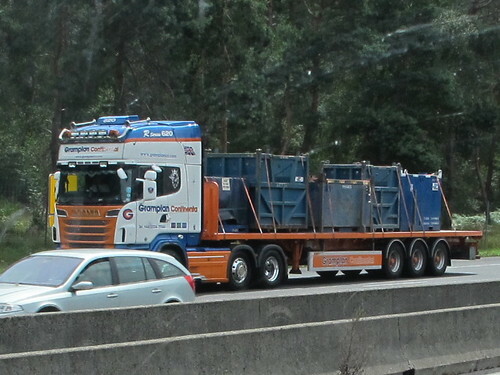 The poor little DAF couldn’t keep up and 2-3 years after getting her I traded her in for possibly my favourite truck from the BJS fleet, an MAN 8.163 with a Hatcher Space cab. 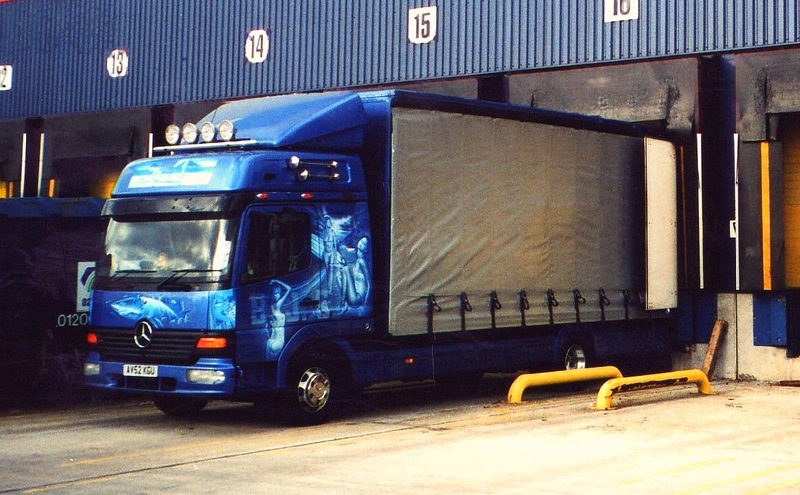 This little German served me very very well and in our prime we were doing Braintree, Essex to Larkhall, Scotland 3 times a week even now and again with a reload of lead rolls from David Park Transport in Newcastle-upon-Tyne, 3 pallets just over 3 ton. From day one I had done the odd run to the Continent but never enough. I was so busy running round the UK that I only ever got to wave as we passed to Steve Marsh as he was also the owner of a smart Hatcher canned MAN. A massive if only, but I believe if only we had stopped for a cuppa I could have still been doing the Continental with a little Tonka you. 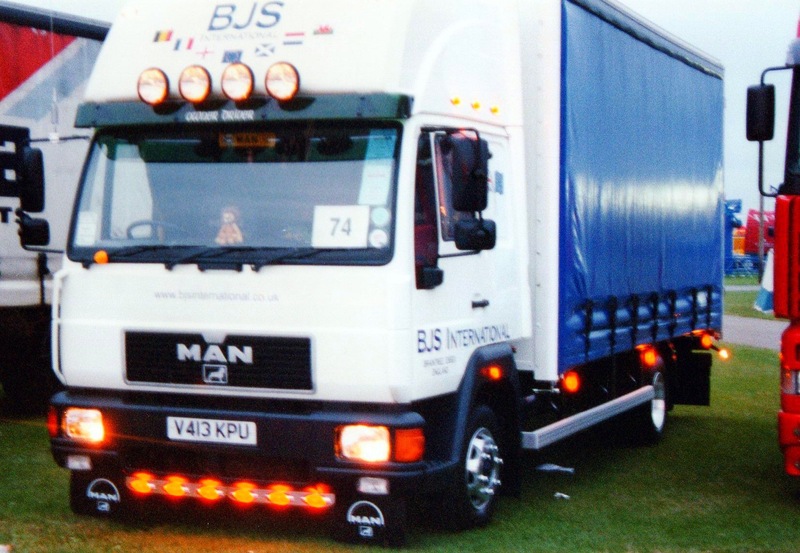 Along with, tail lifts, computers, baseball hats, Chinese menu’s, supermarket light fittings, industrial door fixings and 50-75kg sacks of hand loaded hessian sacks of malt to name but a few commodities I took on a driver and put the real show truck of the fleet on the road and passed the MAN onto my only ever employee Steve Shackle. 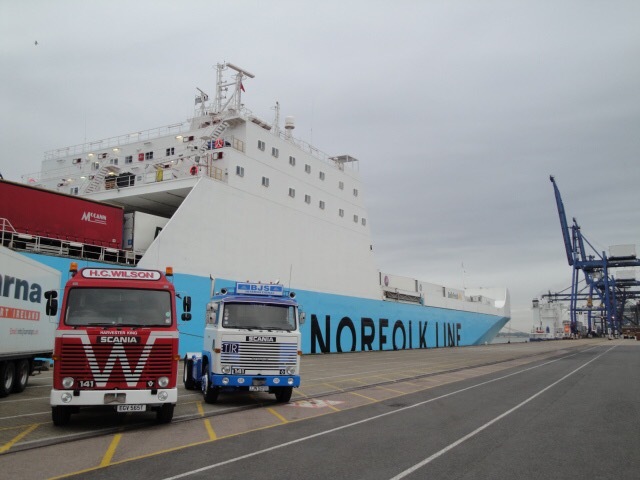 The Atego was awesome and again worked hard across the length and breadth of mainland UK. She was well recognised and got in quite a few magazines. This lead to the start of some Mercedes-Benz friendships that continue to this day. A very big customer went pop with no warning and I was literally in the proverbial dirty river with no oars. So goodbye to the MAN, the Atego and Steve. At the same time I was offered traction work although I didn’t have a class one license at the time. 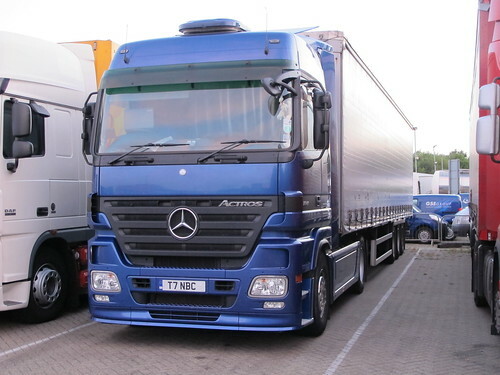 I ordered a Mercedes-Benz Actros of the same man that sold me the MAN and the Atego and two weeks before it went on the road I passed my class one with no minor faults. 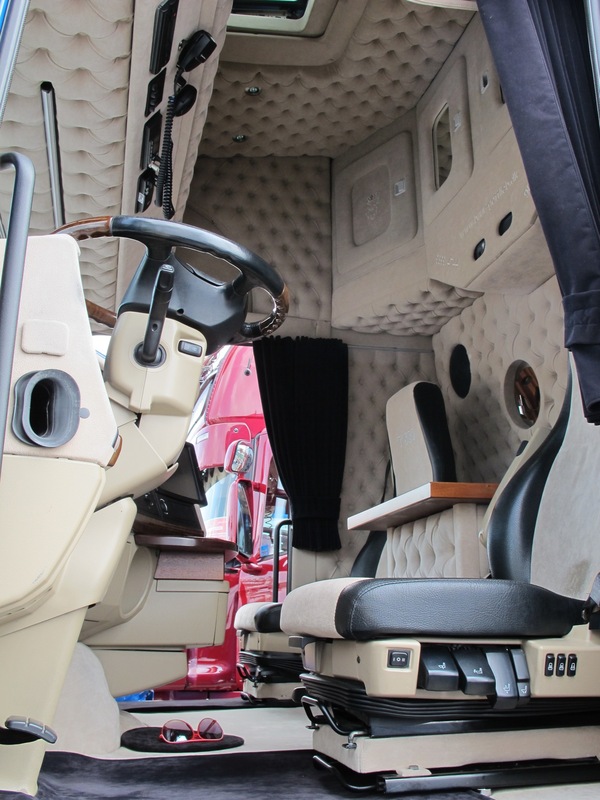 I can safely say that living in this Actros (Claudia), turned me from boy to man. I lived in her virtually for the three years I had her and the long distance lorry driver life was what I hoped it always would be. 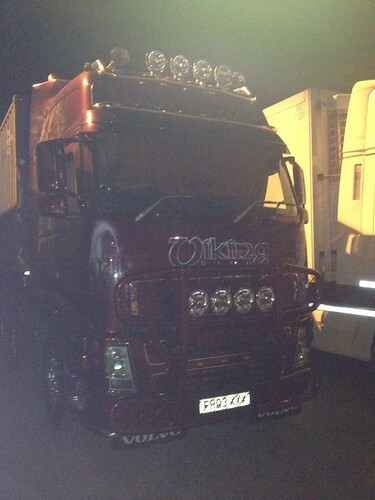 Bloody hard work, great friends, some crazy trucking about and much to my delight a lot more continental. Nothing silly by most of your standards but, Belgium Holland and just into Germany on a very regular basis. Amazing the things you see and the situations you can find yourself in, some good some bad, some exciting and some ‘kin scary and eye opening but none the less it was awesome! 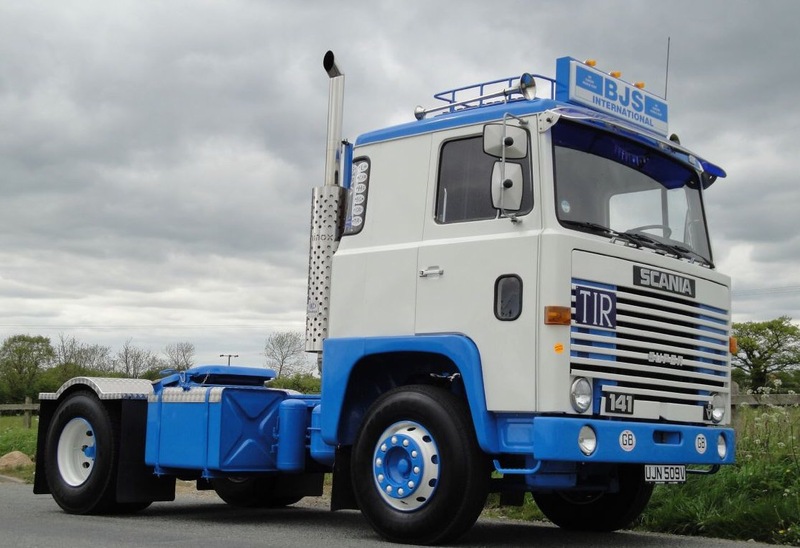 I bought and restored a Scania 141 the same age as me and had agreed with the people I was working for that they’d give me trailer with no more than 15 ton on so for odd weeks I could run the 141 on the continent. Sadly it never happened. The 141 did, the work didn’t and not long after I had to make the hardest decision I’ve ever made and had to give up BJS International. 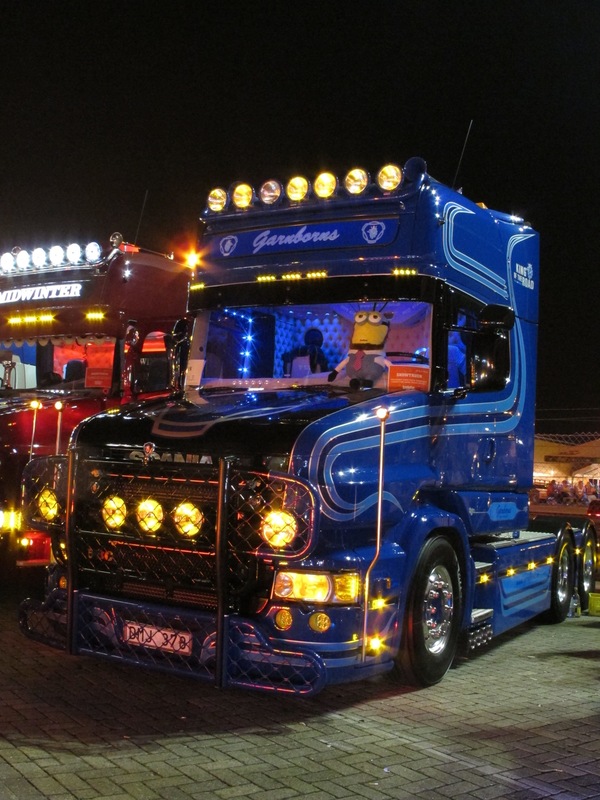 The 141 got me going and the pinnacle was taking her to the Truckstar Festival in Holland. 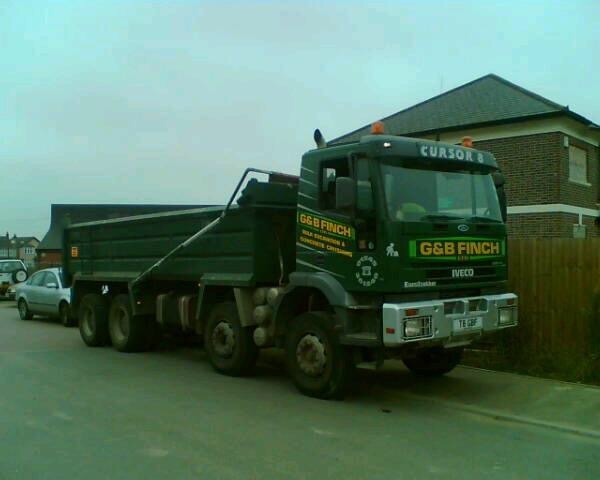 In the real world I got a job with a local firm driving an 8 wheeler around Essex for GB Finch. A fun job and I’m told I still hold plenty of fleet records. Drifting an 8 wheel tipper in wet mud is always good for morale. I landed a job at HC Wilson Transport in the office and this was close to being what I wanted to do. Great people, great job and a great fleet. 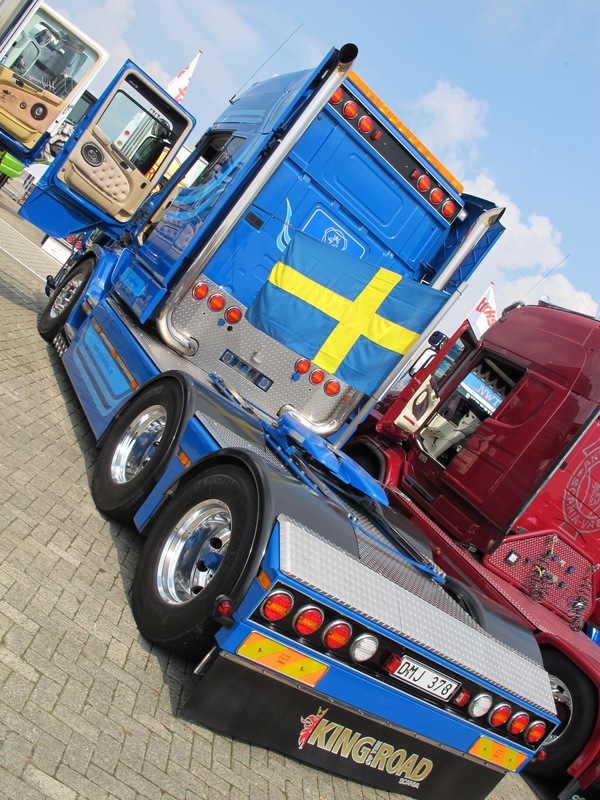 Routing trucks and securing loads all over Europe, Scandinavia and where ever the customer would pay, there’s a lot to learn in the world of international abnormal loads but it was rewarding. 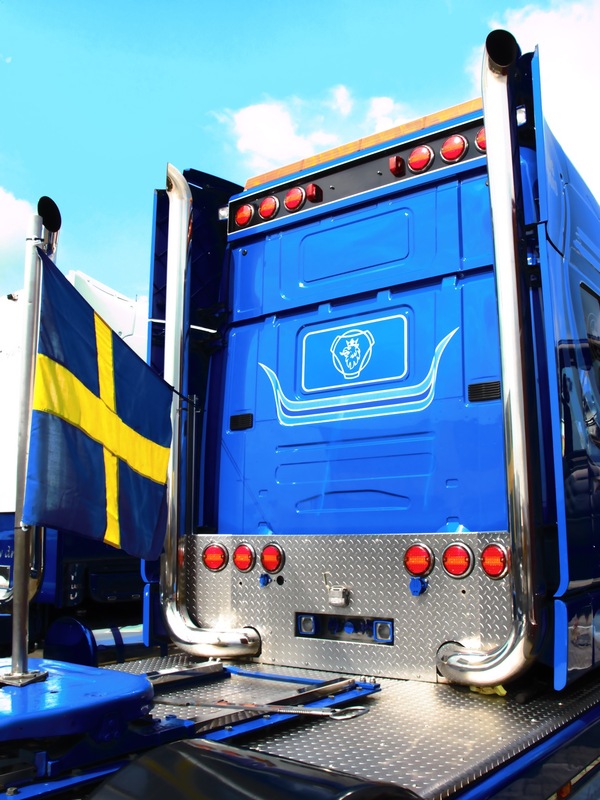 Oh the romance of international trucking! 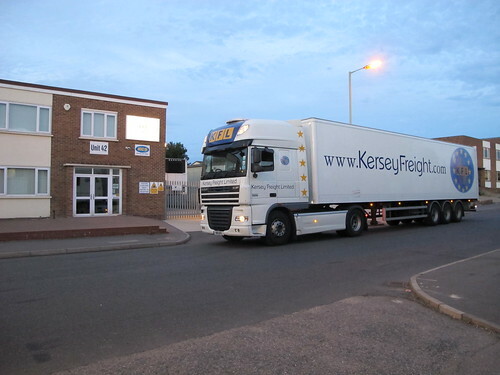 Moving on from Wilson’s having sold the 141 to raise a family, I went to Kersey Freight as fleet manager and holiday relief driver! Long days and on call 24 hours a day was rewarded with the odd spell back on the road doing two trips to Paris a week. Good times although I have to say back then crossing the channel was a breeze. Once again I got itchy feet and have now changed to the other side of the desk if you like and I have great job, spending my time talking about trucks to hauliers. Although not long after starting this dream job I did get offered the chance of being an owner driver again with a mini artic moving flash cars all over europa but age brings a certain amount thought and reality over what your spontaneous side wants to do. Funny old game, but I am a firm believer that once you get diesel in your veins you can’t get rid of it, hence the reason I’m trying to encourage my son to continue with his love of the local zoo and animals, but that’s the start of another hot topic in the press this week #lovethelorry. 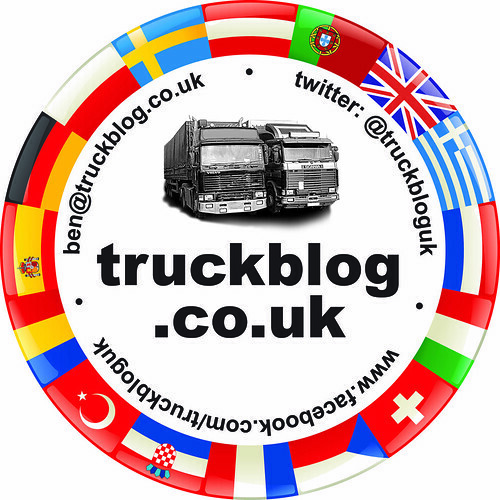 I now have friends across the UK and a couple else where in the world through the blog and I find myself taking a big interest in driver friends daily trucking exploits to satisfy my never ending urge to go back on the road. I’ve not been a truck owner for a few years now and I feel like I have to say that in an AA meeting style! Hopefully in the next year or so I can get another retro show truck to help my marriage and stop me annoying Mrs Blog every weekend!! Anyway that’s me. Happy to talk trucks with anyone and I always question those who spend every day and night involved with trucks but still say that hate them. If only Thursday started as well as Wednesday ended, I managed to read the new DFDS timetable wrong and got in the Dunkerque queue instead of the Calais queue, well at least it proves I’m human!! (I still feel like a prat! sorry Tom). We could have had another hour in bed, which almost proved costly by the end of the day. Anyway on the boat, which actually had a little swell on for the first time and I’m pleased to say that I am a good sailor, even with a belly full of breakie. Dear DFDS, how is it I was first in the queue for cooked breakfast, the eggs appeared from the kitchen and by the time I sat down my breakfast was already pretty cold?? 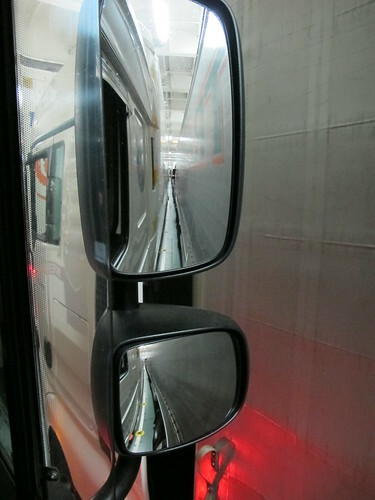 A tip for DFDS truckers, use the microwave! Off the boat and away. 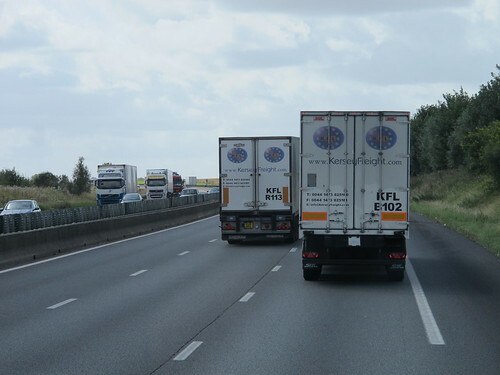 A good run down and we even passed one of our subbies as we cruised along in the big DAF’s enjoying the French sun. Just for a minute I begin to think the day was getting better. 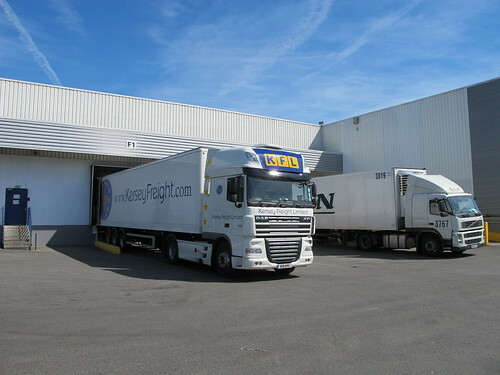 After all I did spot Oakleaf European’s MAN TGL 12 ton fridge heading North as I headed South on France’s busy A1. 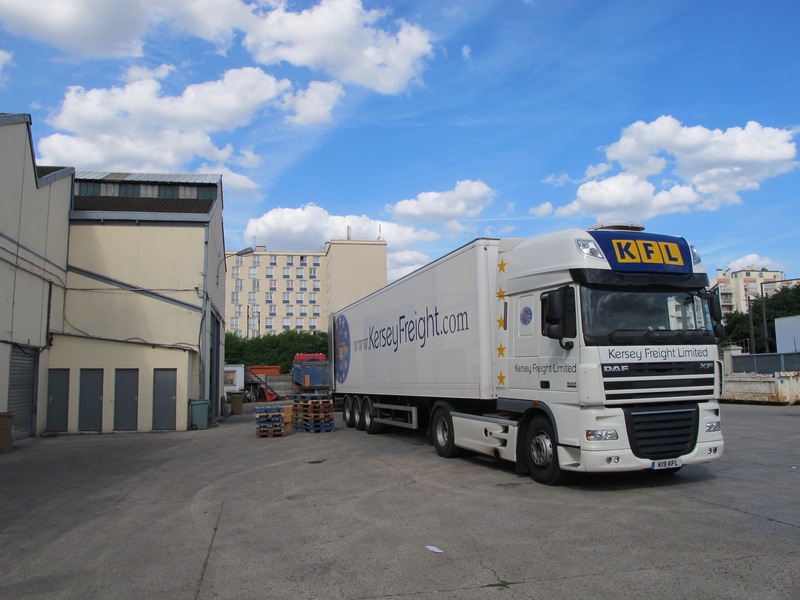 (In a Hannibal from the A-Team voice) Here’s the plan, when we load a trailer for Paris, we advise our customer of our arrival so they can arrange an unloading gang. This is supposedly to avoid any delays as it can take a couple of hours to tip. 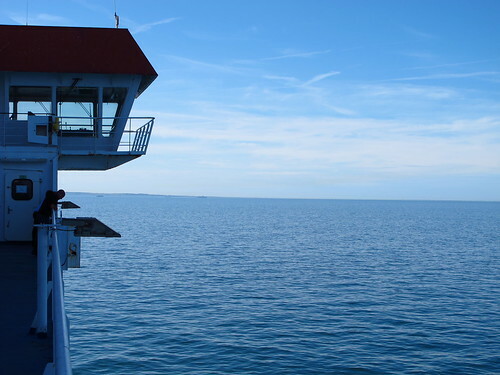 Our arrival takes priority over everything else, that is the deal…or not as the case may be. I was 10 minutes early, so I was chuffed, bearing in mind I had finally caught the sat-nav out! The road layout had changed and a classic piece of trucking history saved the day, for the younger readers it’s made of paper and it’s called a Street Map. I pulled in the delivery yard to find myself greeted by a Ying and Yang situation. 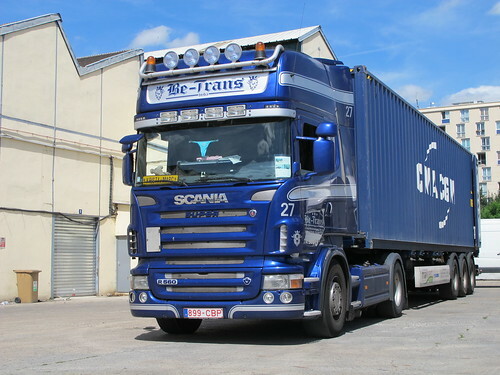 A lovely blue Belgian V8 Scania, but unfortunately he had just opened his rear doors on the 40ft container and the delivery point ignored my arrival and got on with the Belgian. Oh well…..
….5 hours later and lots of emails and phone calls I was finally tipped. What a great day! My reload from the bread factory was surely off? ?…..No re-arranged for 11am Local time Friday. I needed to get as close as possible with the 2.5 hours I had left. No way was I going to make it to the factory, so I plumped for the services just South of Valenciennes on the A2. Once again I pulled in with a few minutes to spare. If I had had another hour I would have made it to the reload point, my own silly fault! I was 30 mins from the bread factory, so I had plenty of time off. You’d think these small services would be fairly quiet but oh no. I parked up and got the dinner ready. The photo you’ve all been waiting for is here, The Dinner Photo. Microwaved Pasta Carbonara, with a fresh ham and cheese salad and baguette from the shop, Deeeeeelicious!! Now while I watching a film, I noticed the Bulgarian next door was having a pleasant meal and a drink at the front of his truck with who I naively thought was his wife/girlfriend. I happened to notice that they were getting quite fruity but purposefully left the drivers window open with the curtain open too. I also noticed there was a dodgy looking geezer in a car directly opposite whistling signals to the truck, well the woman actually. Are you working it out?? About 11pm and after much activity in the Bulgarian cab, the lady (or not) left our satisfied Bulgarian friend, jumped in the car with the dodgy geezer and drove off. I dare say a few hundred Euro’s better off! That not being enough I woke the next morning, opened my curtains only to find that all round the front of the truck and trailer I was surrounded by Danish pensioners. I decide a refreshing shower was required to bring me back into the real world….No the showers were buggered. Sod it, off to the load point on time for my loading slot. Will it be like the first trip? A few 3 hour delay before loading? It is Friday afternoon after all. No such inconvenience, I was there all of 42 minutes I think it was. 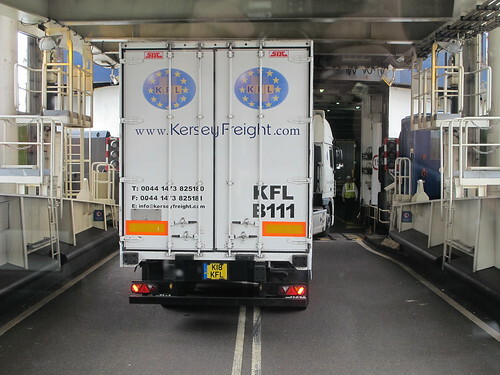 Off the boat into a busy Dover, straight out and up Jubilee Way, this time I remembered the bump. No problems up the A2/M2 through Dartford onto the A12. No V-Festival traffic at Chelmsford so straight back to Hadleigh. 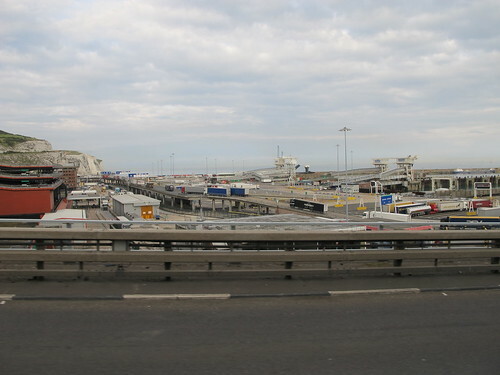 From arriving in Calais all had finally gone smoothly, meaning I had a nice end to my week on the road. Just over 2600km I think it was. I was the fleet of the fleet home and by 10pm I was back at my house, still with no wife and boy as their holiday didn’t finish til Saturday. Will I do it again? Oh yes, bring on next years summer holidays!! 0445hrs Monday 13th August, I arrive in the Kersey Freight yard in Hadleigh,Suffolk. 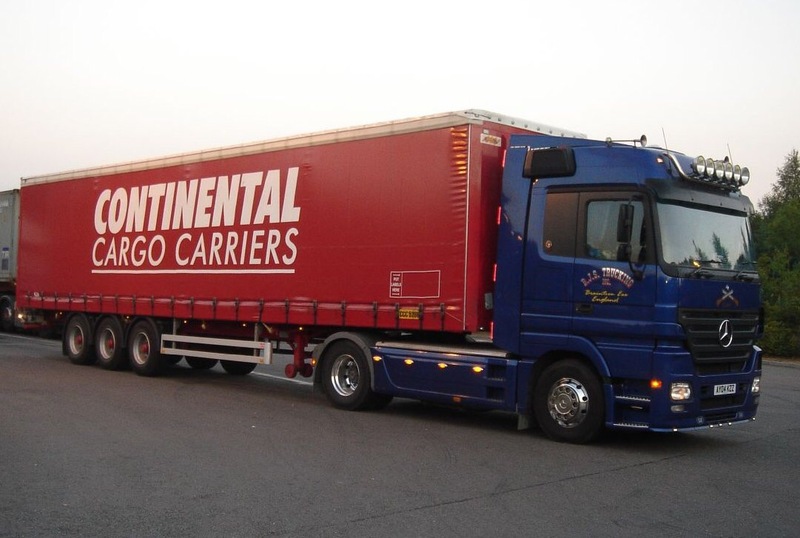 I meet up with our other driver the Welsh wonder that is Geraint Richards, we do our daily checks, I chuck my bits in K19 KFL and we leave the yard just after 0500hrs. An easy drive down to Dover and we arrive in time for a busy 0825hrs sailing to Calais with P&O. 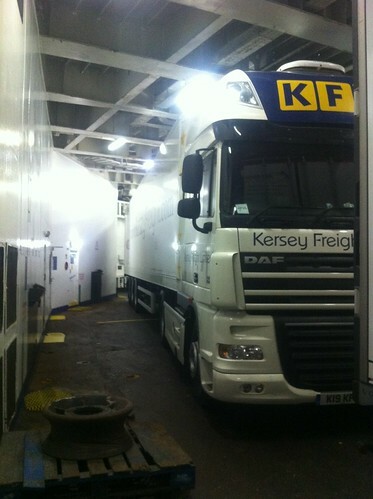 We were the last 2 trucks on the sailing and I have to say that I did wonder if I was going to fit on, but it seems that there is always space on the channel ferries for another one! 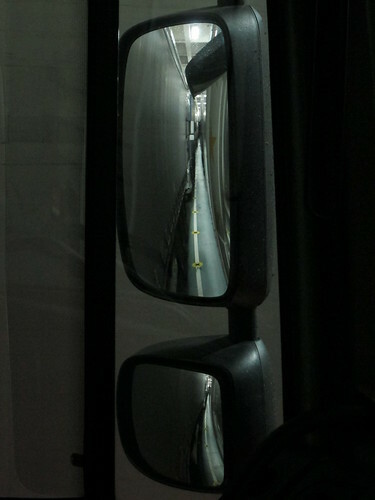 If you look below you can see the ferry door just behind the trailer and the man with the yellow vest on the ferry who guides you on had to see me through the gap as my mirrors were folded in. 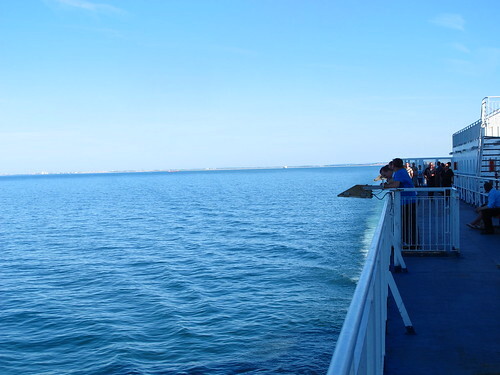 As it goes the man who waves you on and off these ferries must have the easiest job in the world as it seems he is the same as the bloke at the airport with the table tennis bats who waves the planes in and out, the biggest spotters in the world!! Off the ferry and away down the A16 A1 to Paris, its about 3 1/2 hours. Fairly uneventful ride down, lots of spotting and lots to see once your join the A1. 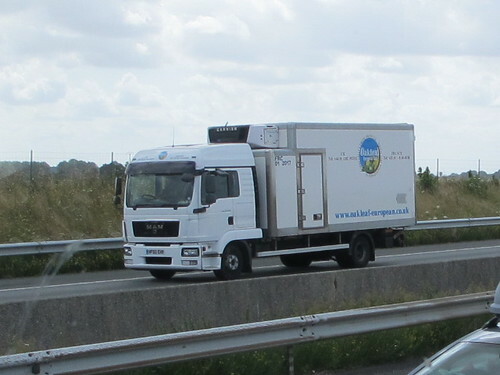 The A26 is fairly quiet, but the A1 is used by all the Dutch and Belgians, it is almost an I-Spy book of international show trucks. 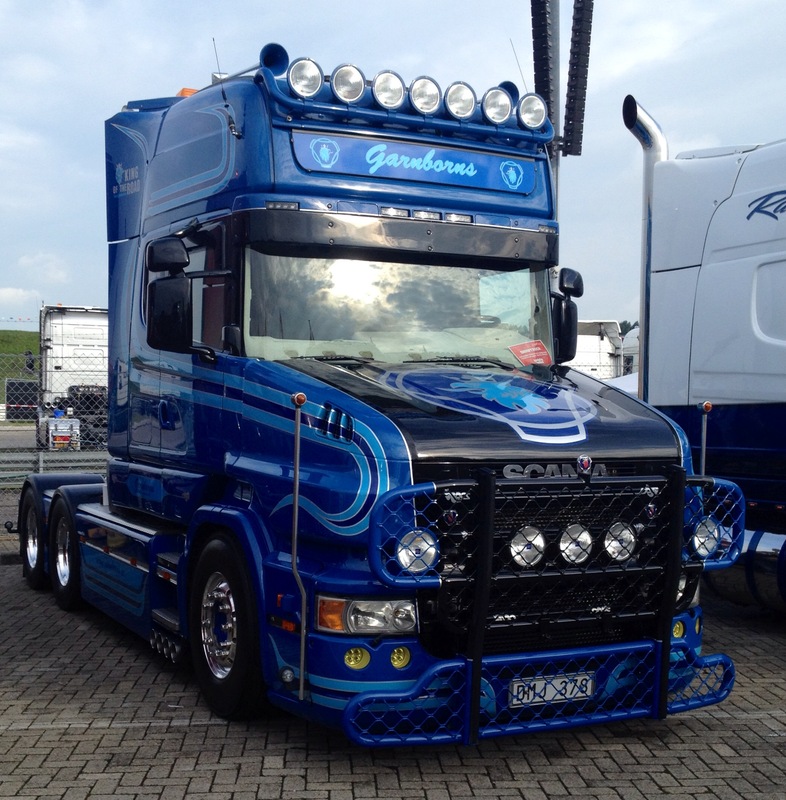 There are always trucks you recognise from the big Truck Shows. 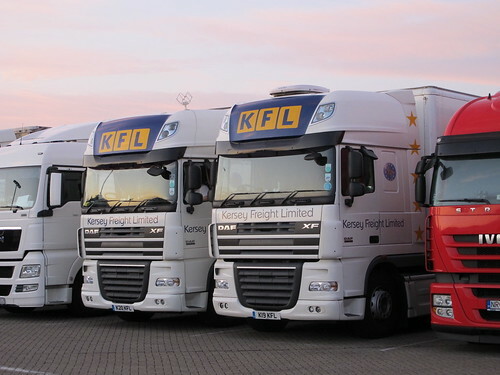 A few British trucks, some drivers even still give you a quick wave which is nice. My delivery was just off the Motorway at Aubervilliers, so nothing to taxing. I pulled into the yard only to be greeted by a 20ft container on the unloading bay, but luckily for me he was nearly finished, so I sat in the truck for 10 minutes until it was time for me to get on the bay. 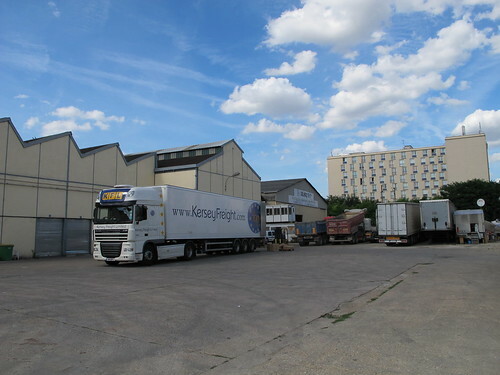 Still 10 minutes is long enough for the yard dogs to p*ss up all 10 wheels on truck and trailer……Welcome to Paris! Just about 2 hours later I was tipped, the reload came through, loading from Feignies near Maubeuge up on the Belgian French border. I needed to get my skates on as time was beginning to run out, well it looking ahead it was running out, and being in mind I still had to get out of Paris. It’s amazing to see that in such a huge international city as Paris, there are real proper slum areas. I mean real slums, cardboard and plastic bags for houses, scrap cars burnt out, pallets are like gold dust for walls and always disappear from yards if they are left out. Any way I make it to Feignies and park just over the road from my load point the following morning. Day 1 done and about 750km under my belt, the longest day of the week. The biggest problem of parking up later than the rest is the lack of choice, so I had the pleasure of parking next to 3 fridges all running on constant, lovely especially as it was to hot to shut the windows. Off the ferry around 1830hrs UK time and off to Rugby, this gave me about 3 1/2 hours driving to do in about 3 1/2 hours, or there abouts. I decided on Rugby Truckstop as it is still a fairly safe place to park, but what is a fair price to pay for safe truck parking?? A debate for another day. I shot up the A2 as it it’s a bit quicker than the M20, especially with only 6 ton on board the 460hp DAF was under no strain. While i’m at it, who evers idea it was to put what can only be described as a speed hump 100 yards up Jubilee Way, needs shooting! Apparently its to cover a weak joint in the road, but even so! I’m glad I wasn’t heavy. Up the A2, M25, M1 and not single hold up or slow down. I rolled into Rugby Truckstop with about 5 minutes to spare, perfect! I also found a space bearing in mind it was now nearly 10pm. A well earned shower and a pint of the black stuff before bed. 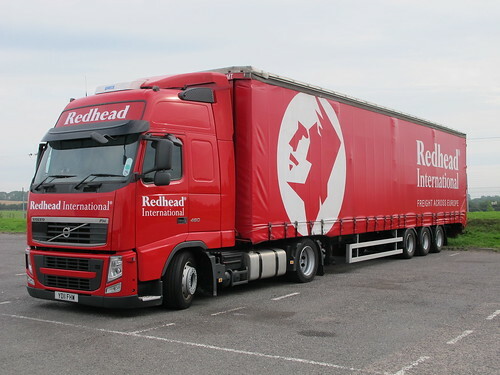 A quick walk around the truck park and not a lot to report other than the purple Viking Volvo and a nice Redhead International truck parked opposite me when I woke up. 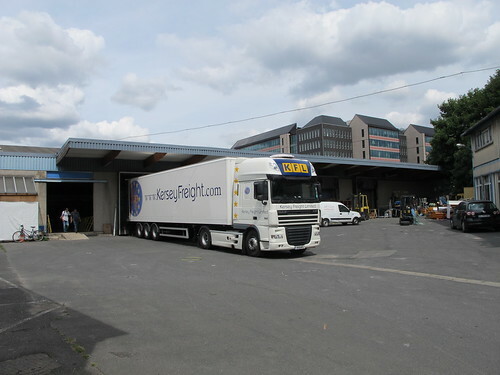 Wednesday morning I get tipped and run straight back to the yard as there is a loaded trailer waiting for me to go straight back to Paris again Wednesday evening. No time to pop home and get more pants, Tesco’s for some new ones is the answer!! Whats it like to be properly back on the road I hear you ask? ?………Love it. 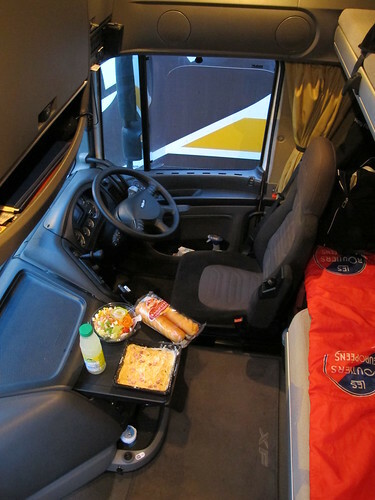 Part 2 coming later, including the obligatory in-cab meal photos.